- Hi, John! I have a new task for you. We have received a "brand new server". But it was retained in the dealer's warehouse for 3 years, so please, could you go to our very-cold-server-room and make all firmwares upgrade? - Of course Boss! It will take just 4 hours, while I try to connect something to boot from (since there is no CDROM or FDD inside), and then reboot server for seven times after each peace of FW upgrade. And, by the way, I need to check 5-dimensions compatibility matrix to download the proper upgrade... And that's it! Hope we will not need this very-expensive-emergency-on-site support to repair the server this time. Sounds familiar? I remember those times, when you need to check the floppy-diskettes consistency before upgrade, because a single read-error can lead to an unrecoverable HW failure. 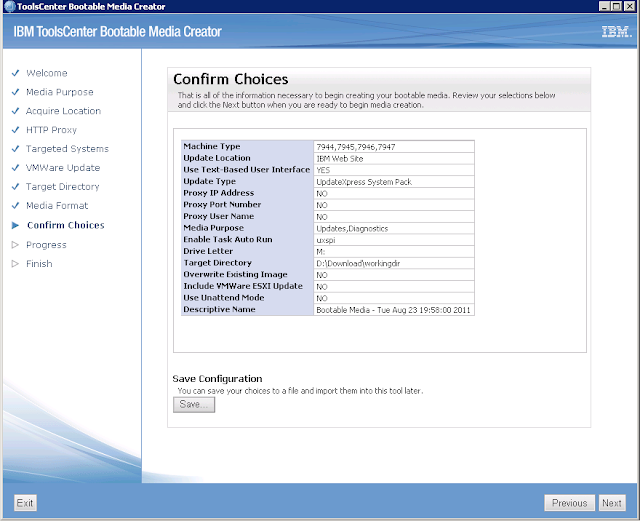 Of course, most of the equipment manufacturers provides us with FW upgrades for any type of upgrades - bootable CD images, images for USB-drives, for most popular OSes, etc.. And, probably, most of IBM server maintainers are aware of the very useful tool - Bootable Media Creator (BoMC). Well, there is no need for detailed description here, since it can be found on the official page. In my short free interpretation - You can easily deploy FW upgrades for IBM Server x and BladeCenter with images created by the BOMC tool. Last year, when I have some unpredictable IBM server behavior, in about 90% of cases it was enough to create a fresh CD with the FW updates set, then boot once, and problem just disappears.